Background: Recent studies have revealed considerable scope for improvement in preventing postoperative venous thromboembolism. 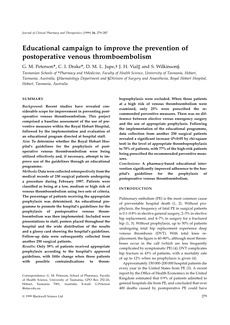 This project comprised a baseline assessment of the use of preventive measures within the Royal Hobart Hospital, followed by the implementation and evaluation of an educational program directed at hospital staff.Aim: To determine whether the Royal Hobart Hospital's guidelines for the prophylaxis of postoperative venous thromboembolism were being utilized effectively and, if necessary, attempt to improve use of the guidelines through an educational programme.Methods: Data were collected retrospectively from the medical records of 250 surgical patients undergoing a procedure during February 1997. Patients were classified as being at a low, medium or high risk of venous thromboembolism using two sets of criteria. The percentage of patients receiving the appropriate prophylaxis was determined. An educational programme to promote the hospital's guidelines for the prophylaxis of postoperative venous thromboembolism was then implemented. Included were presentations to staff, posters placed throughout the hospital and the wide distribution of the results and a glossy card showing the hospital's guidelines. Follow-up data were subsequently collected from another 250 surgical patients.Results: Only 59% of patients received appropriate prophylaxis according to the hospital's approved guidelines, with little change when those patients with possible contraindications to throm- boprophylaxis were excluded. When those patients at a high risk of venous thromboembolism were examined, only 25% were prescribed the recommended preventive measures. There was no difference between elective versus emergency surgery and the use of appropriate prophylaxis. Following the implementation of the educational programme, data collection from another 250 surgical patients revealed a significant increase (P<0·05 by chi-square test) in the level of appropriate thromboprophylaxis to 70% of patients, with 77% of the high-risk patients being prescribed the recommended preventive measures.Conclusions: A pharmacy-based educational intervention significantly improved adherence to the hospital's guidelines for the prophylaxis of postoperative venous thromboembolism.